I never thought a Saturday morning of yard work would be so profound. Let's get this straight. I have allergies. I don't do outside. I don't do bugs. I don't do dirt, and I'm not a fan of heat. I'm not completely new to yard work, but let's just say it's been a while. I used to help my grandfather in his garden in exchange for playing in the sprinklers afterward. So, here I am with my face mask, gloves, and hoe... and God starts to speak. 1. Pull the weeds up straight. 2. Make sure you pull the roots up. 3. Use the hoe to help you. Pull the weeds up straight. Lesson: So, you have to get the whole weed not just what's visible. Weeds have strong roots. What you see on the surface is only a tiny bit of what's happening underground. If you just pick what you see, you're not really dealing with the issue only what's visible. Go deep! Make sure you pull the roots up. Lesson: Get to the root. Take the time. Do the work. Put in the sweat equity. Don't let those roots stay in the ground. They will produce and multiply and overrun your garden. They will choke out your plants and whatever else you are trying to grow. Sidenote: Some weeds look like grass and you can't tell the difference until you pull it out and see the root. Sidenote 2: Be careful about who you keep close. Some of them are weeds. Their sole purpose is to grow with you to ultimately hinder you. All weeds don't stifle growth, some just stifle your maturity. Use the hoe to help you. My Native New Orleanian is screaming, "there are some hoes in your life who can help you." Cue my organ. Lesson: There are people in your life who have learned the lesson....the hard way so, you don't have to!!! Glean from their experience and understanding. Sidenote: A hoe is a garden tool. Its sole purpose is to be used. I'll stop right there. Lesson: You can't just stop because you pulled up one weed. There's more. Gardening is messy work. Your hands will get dirty. It requires strength. It's uncomfortable. It's a process, but the results are worth it. Pull the weeds up from the garden of your heart. Get to the root. Use the tools that God has given you and ask for help if you need it. 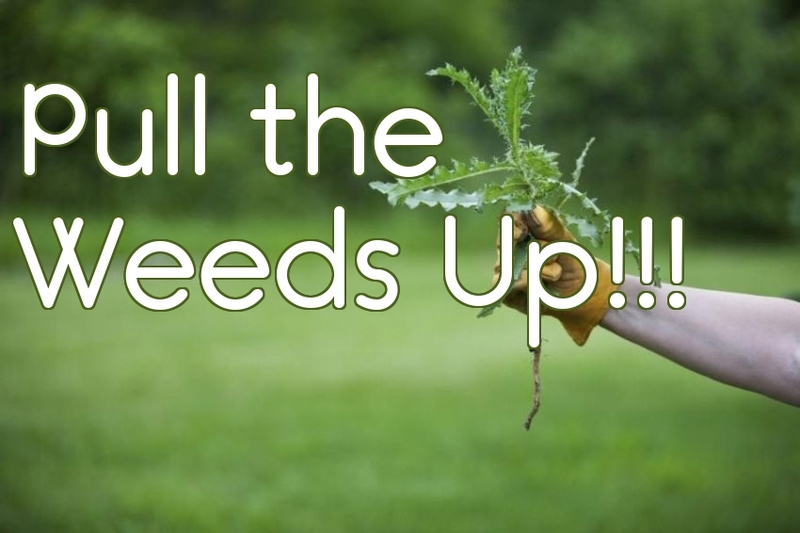 Pull the weeds up!! !